The Second Officer, Edward Maloney took one of the boats as close to the ship as he possibly could and called out to the Captain �There�s no possibility of landing on the beach, it�s no use putting passengers into the boats unless they can swim from the boats to shore.� A group of passengers said that they would swim ashore, there was plenty of room but only six volunteers got into Maloney�s boat. They rowed in as close to the surf as they could go and all the passengers went over. Maher was landed on the reef, he had volunteered to swim to the part which was above water, where Morrison reported had reported the landing place, and with heaving lines, help women passengers to the shore. He was taken within thirty to forty yards of the spot. He made a line first around his body, and jumped overboard, then finding that his line was too short, signalled for them to release the rope. The next attempt to get passengers to safety was made, the Captain asked for any other swimmers. three passengers came forward, as well as a fourteen-year-old boy, a brass cleaner, they were placed in the boat with the First Officer and his crew, small lines were also swung down. �Pull to the reef� ordered the Captain. Lindsay took the lifeboat towards the reef but found impossible to land there as the sea now washed right over and the tide was rising. So he pulled over to the clear water to go as close to the beach as he could, making for the same spot where the Second mate had earlier landed Lawrence, but slightly farther west. An oar was used to try and establish depth and it was found to be about eight feet. A heavy sea seemed to curl about, causing the boat to cant over, and the sea rushed into her over her port quarter. Lindsay was steering and he tried to get her head to sea, but another wave came in, the boat capsized end over end. They were about seventy yards away from the shore. One of the crew Thomas Dixon struggled in, then removed his boots and trousers and tried to get back to the boat, but it was too far out. Then suddenly it came in on a breaker to the beach. The young boy that was with them got his hands around Dixon�s neck and took him under four times, when the boat struck the boy. He was drowned but the others made it. 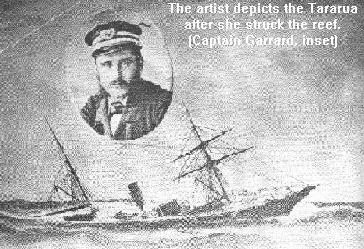 Captain Garrard�s two Chief Officers and eight crewmen were now either out to sea or on shore. An effort was then made to get a line on shore by hoisting a lifebuoy with a line attached, but that proved useless. About eleven o�clock the sea became very rough, the Captain ordered all the men into the exposed forecastle head. The women and children were still huddled together in the smoking room. A huge wave washed away the cutter hanging in the davits, and shortly after the dinghy was washed free, leaving the Tararua with no boats on board at all. Anyway there were few crewmen left aboard who could handle a boat. 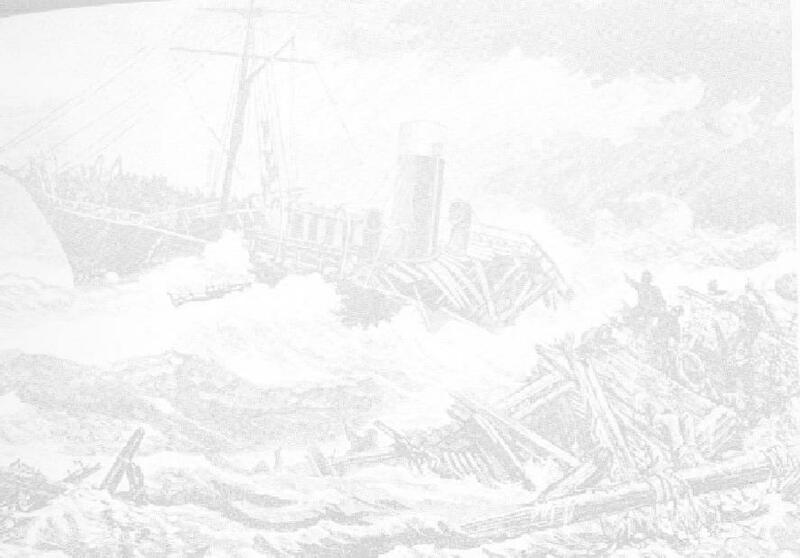 The Tararua was being pounded mercilessly, then suddenly the Captain started and shouted �Look out for the ladies.� for he had seen the forecastle bridge about to collapse under a wave, and now it was gone. Immediately the women and children were moved to the forecastle head with the men, they had to watch for a break in the seas washing over, and this took almost three quarters of an hour. By now it was obvious to everyone on the beach that an attempt to get back to the Tararua would be impossible. To those on the forecastle of the Tararua, the sight of people and more people appearing along the sand hills, must have raised hopes, but the frightening turbulence of the surf between the ship and the shore proved to be an insurmountable barrier to both groups. Then two men were seen swimming towards the shore with a plank between them, but the surf hampered their gallant try. One of them left the plank, and came in on a roller and was seen struggling a few yards from the edge when a strong backdraft caught him and he was carried back to sea and not seen again. Then another swimmer was seen coming in with a lifebuoy around him. Helpers ashore ran into the surfs edge to help him. He tossed and rolled and then went out of site, reappeared, and then they got hold of him and dragged him out from the backwash had almost buried him in sand. It was very sad, all attempts of resuscitation failed, and he was laid aside, ironically he was the only one to use a lifebuoy. All hopes of survival lay in the sea becoming calm enough to make the rescue of the stranded passengers and crew somehow possible. It was a heart rending situation for those on shore, as they saw wave after wave washing people overboard, and although they searched diligently, their efforts were fruitless, as they cloud not find a single survivor. The Second Mates boat which had stood out to sea was to make several attempts to go back to the Tararua, but each time was forced back by the dangerous high seas. They just had to sit and watch , cold and hungry, and just as helpless as those on the shore. Almost 10 pm they heard a single voice calling �A boat! For Gods sake send a boat.� They supposed it to be Captain Garrard calling. at 2.30 am they heard shouts of �Help�, then heart rending shrieks - then silence in the darkness. Go to Passenger and Crew List.